Time: 4 hrs. 15 mins. 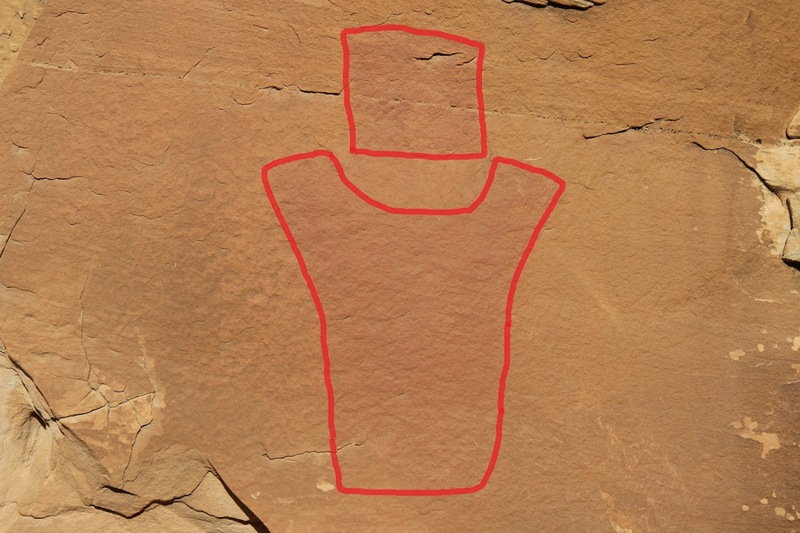 Ernie Canyon is located within a Wilderness Study Area in the southern area of the San Rafael Swell between Green River and Hanksville, Utah. The trail goes through several sections of narrows as it passes through the deep canyons of the San Rafael Reef. Along the way there are a few faded pictographs, a natural bridge and a natural arch. On this trip we also encountered one of the native bighorn sheep that inhabit the area. To get to the trailhead drive south on Utah Highway 24 from Interstate 70 for about 18 miles. Less than a half mile past mile marker 142 turn west on the unmarked Lost Spring Road. Measuring from the gate the road will cross a wash just past the half mile point that requires a high clearance vehicle. At the 0.9 mile point take the right fork and continue for another 1.9 miles to another fork. Take the left fork and drop down the hill and cross Ernie Wash where after a little more than a quarter mile it comes to an end at the Ernie Canyon trailhead. We have driven the last stretch across the wash several times in 2wd but on one trip we got bogged down in the sand turning around and had to use 4wd to get out. 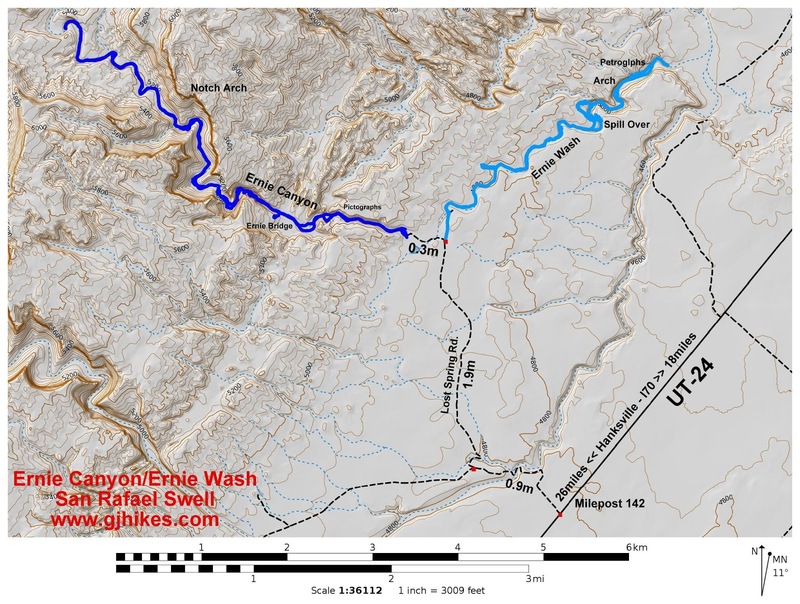 There is a pole fence across the mouth of Ernie Canyon that you can find routes around on both ends to get into the wash and begin hiking. The canyon is open only to hikers and horseback riders but as you can see from the tire tracks there doesn't appear to be any enforcement. The route into the canyon begins with an easy section of narrows that lasts for a half mile or so. 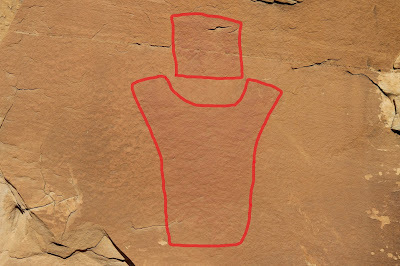 As the canyon begins widening there are a few very faded pictographs on the right hand side of the wash. There are about 3 different panels that are stretched out over a distance of a few hundred feet. The canyon widens out and around the 1 mile point you can spot Ernie Canyon Bridge on the left hand side of the wash.
Just past the bridge we came upon one of the areas bighorn sheep. This photo was shot while the bighorn was in midair. At one point it ran about 10 feet up the side of the cliff as though to gain altitude and momentum for its next big jump. Then it just stopped on top of a boulder and quietly stared at us and posed for several more pictures. 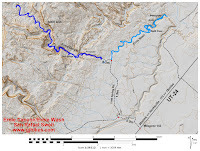 The wash passes through a much deeper section of narrows that winds its way through a passage of reddish wingate sandstone cliffs that have eroded into a pleasing display of geological features. 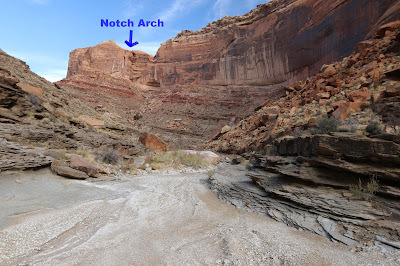 As the canyon begins to widen once again a keen eye can spot Notch Arch way up near the rim behind a point in the cliffs. 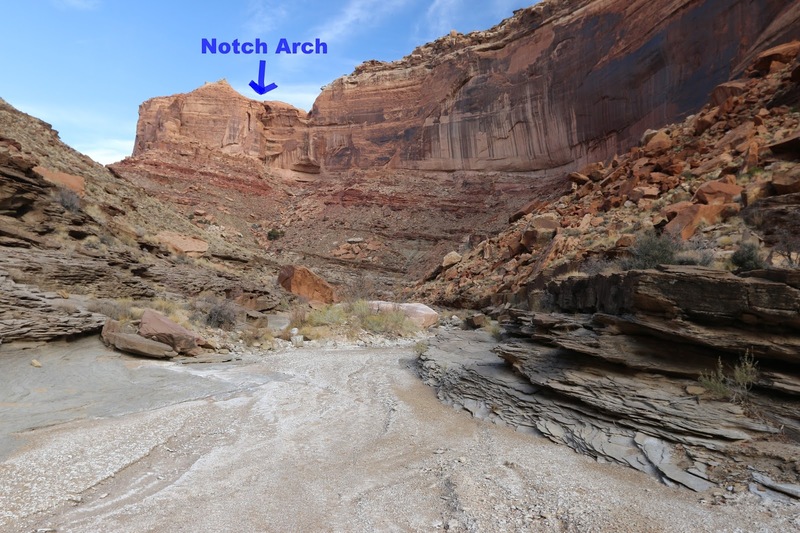 Like many of the arches in the San Rafael Swell Notch Arch is hard to get close enough to for a better appreciation of it. For this post we turned around near the 5 mile point after having hiked completely through the reef. Rockhounds will find a lot of muscovite mica, geodes and petrified wood. This photo is of a tree trunk that is probably about 18 inches in diameter that is slowly becoming visible as the bank erodes from around it. Petrified wood is common around the San Rafael Reef. Ernie is a fun canyon to explore. The changes in elevation are so gradual that they are practically undetectable. 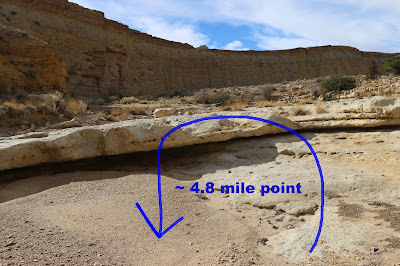 There are several primitive campsites that are up away from the bottom of the wash as well as at the trailhead. Remember to never set up camp in a wash. When it rains around here the canyon walls become waterfalls and the washes become raging torrents. For those that have trailers there aren't any good places to park along the Lost Spring Road. You will find better accommodations near Temple Mountain. The narrows in Ernie Canyon don't get anywhere as skinny as some of the areas famous slot canyons but they are still a lot of fun to hike through. If you would like to see it for yourself then all you have to do is 'Take a hike'.